WRIST | GEORGE D. GOUDELIS MD. Ph.D. 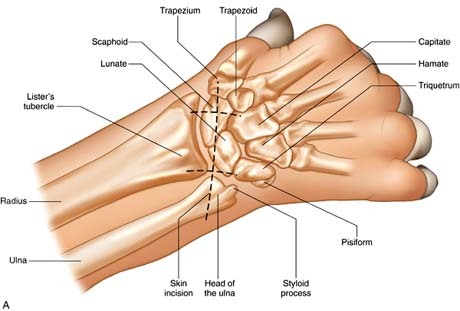 The wrist consists of several synovial articulations, between the distal radius, the distal ulna, the proximal carpal row (scaphoid, lunate, triquetrum, pisiform), and the distal carpal row (trapezium, trapezoid, capitate and hamate). The radiocarpal joint between the distal radius and the proximal carpal row and the distal radioulnar joint between the radius and the ulna are separated by fibrocartilage, called triangular fibrocartilage, which extends from the ulnar aspect of the distal radius to the base of the ulnar styloid. The midcarpal joint is located between the carpal bones and is separated from the radiocarpal joint by two intrinsic ligament. Structures enter the wrist through several fibro-osseous tunnels. 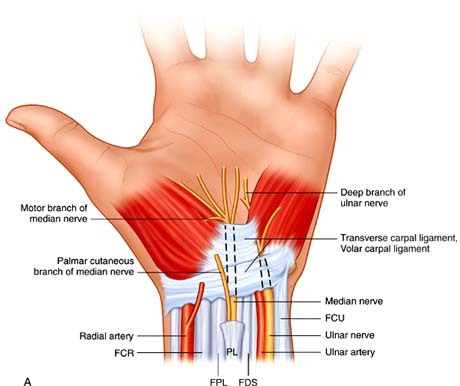 In the volar wrist, the carpal tunnel contain the median nerve and tendons. Guyon’s canal or ulnar canal is also volar adjacent to the pisiform, which contains the ulnar nerve and ulnar artery and veins. 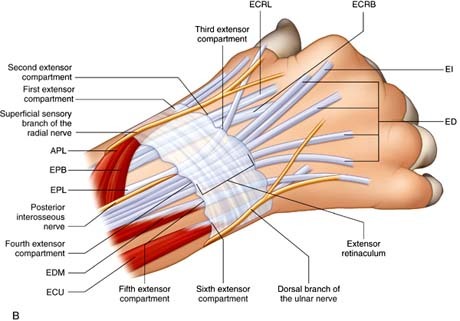 The tendons of the dorsal wrist are also separated into six fibro-osseous compartments. Wrist joint. Eight carpal bones. Proximal: scaphoid, lunate, triquetrum, pisiform. Distal: trapezium, trapezoid, capitate, hamate.